This post has been sponsored by Wayfair.ca however, the opinions and content in this post are my own. We’ve still got a whole month of summer left and that means a whole month more for some delicious summer sips! 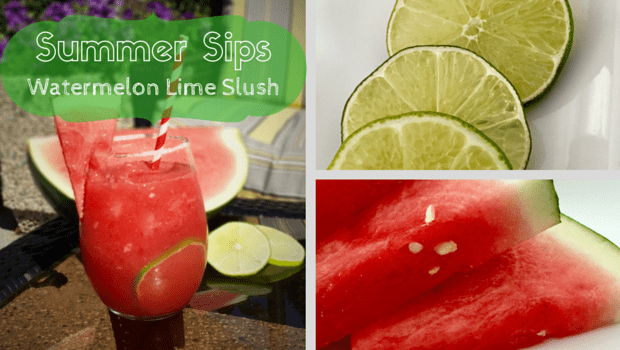 This Watermelon Lime Slush will hit the spot on those hot days and it’s a great refreshing drink to serve to your guests at your next backyard barbecue. You will need the following ingredients to make a your Watermelon Lime Slush. This amount will make 1 drink. Cut one lime in half and squeeze the juice from both halves into the blender with the 1 tsp of simple syrup. Start blender and mix until your desired consistency. (I like to have mine completely blended into a liquid). Once finished put it aside. Put your cup of ice into the blender with a splash of your watermelon mix and blend until the ice has become a slush consistency. Pour ice mixture into your cup and pour watermelon mix over top and mix. This drink is the perfect amount of sweetness and tartness mixed together. If you’re looking to serve this drink as a boozy option, adding a shot of vodka or rum will compliment it very well. What are some of your favourite cool off drinks for the summer? Would you add something different to the Watermelon Lime Slush? To find Beverage Serving Options and inspiration for your summer sips as well as anything home decor check out Wayfair online today!